Originally published in 1917 as Kansas Geological Survey Bulletin 3. This is, in general, the original text as published. The information has not been updated. An Acrobat PDF version (265 MB) is also available (includes plates). SIR—The remarkable development of the oil and gas industry in Kansas within the last few years has attracted nation-wide attention. The demand for authentic information and for geologic assistance in the development of the state's oil and gas resources is very great and is constantly increasing. The present report has been prepared by the state geologist and his assistants with the hope that it will meet the present needs of citizens in the state and aid in the production of these commodities which are of such national economic importance at this crisis. It is noteworthy that practically all of the work represented in the report is contributed without expense to the state. The report will constitute Bulletin 3 of the Reports of the State Geological Survey of Kansas. For many years Kansas has been an important producer of petroleum and natural gas. The first indication of the tremendous oil and gas deposits which have supplied the production of the Midcontinent field, including Kansas and Oklahoma, was found by drilling in eastern Kansas. Although surpassed in total value of production by Oklahoma, the Kansas fields have, nevertheless, attracted wide attention. Thousands of wells have been drilled in the central and southeastern parts of the state, and the position of Kansas as an important oil and gas producer has been firmly established. 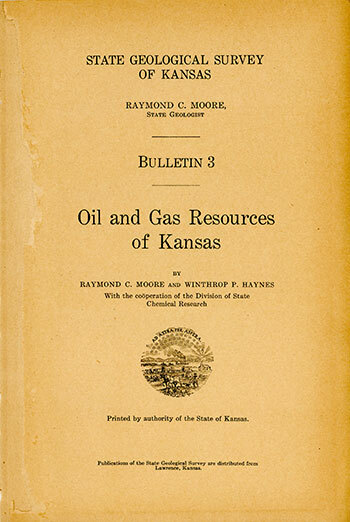 In the course of development of the oil and gas resources of Kansas, the University Geological Survey, under the direction of Erasmus Haworth, prepared a detailed account of the oil and gas geology and general stratigraphy of the eastern portion of the state. This report, published in 1908, embodies investigations made by the Survey throughout a long period and is the only authoritative account of the geologic formations and the general structure of the oil- and gas-bearing rocks in the Kansas district. It has been of enormous benefit to all seeking information concerning the oil and gas fields of Kansas, and without question it has aided very considerably in scientific development of these great natural resources. For some time the edition of the special report by Haworth has been exhausted. By far the most rapid and important development of the oil and gas industry in Kansas has taken place within the last ten years. During this decade production has been largely increased in areas previously explored, and many new districts have been opened up, among them the remarkable Butler county fields. This rapid expansion has multiplied a number of times the total production of but five years ago. In 1911 the total production of Kansas was 1,278,819 barrels, valued at $608,756 (U.S. Geological Survey, 1911). In 1916 official figures [U. S. Geol. Survey. Press Bulletin. July. 1917] show a production of 8,738,077 barrels, valued at $10,339,958. Further, commercial deposits of oil and gas have been discovered far beyond the limits of producing territory at the time of publication of the report previously mentioned, and it is possible that deposits will be found in other entirely new districts. At the present time there is indication that in the near future deep tests will be drilled in almost all parts of the state. Under the situation, the demand by citizens of the state for all available scientific information concerning the oil and gas geology and prospects in all parts of Kansas is very natural. So urgent has been the demand upon the State Geological Survey that time has not permitted the preparation of a carefully detailed report. The very limited financial resources of the Survey, also, have made impossible any detailed field examinations. Nevertheless, the Survey is able to supply much of the information desired, and will endeavor to gather additional material as far as the means at its disposal permit. In the preparation of a bulletin of this nature there are two points which must be borne in mind carefully. First, the information which is presented must be that which is needed by those technically trained in the subject of geology, the petroleum geologists, upon whom largely depends the further development of the oil and gas resources of the state. It must be organized in such a way that it is most readily available for their use. Secondly, however, the report must present its somewhat technical information in such a manner that it is readily intelligible to citizens untrained in the science of geology. The deep interest of a very great number of the citizens of Kansas, as well as of an increasing number outside the state, is evidenced by the requests for information which reach the office of the Survey daily. This need is very important, and in view of the very widespread general interest in the oil and gas development of Kansas it has seemed desirable to give special weight to this consideration. Consequently, while adhering to the strictly scientific discussion of the subj ect, effort has been made to present the problem of oil and gas production in as simple, direct a manner as possible. It is earnestly hoped that as an aid in the further development of these most important natural resources, and in the dissemination of information concerning them, this report will be of great value. The voluminous literature dealing with the geology of Kansas and the numerous works upon petroleum and natural gas geology and technology have been freely used in the preparation of this report. As far as possible reference has been made to important sources of information in the text. Special mention may be made, however, of the writings of Erasmus Haworth, C. S. Prosser, J. W. Beede, John Bennett, W. N. Logan and F. W. Cragin on the geology of Kansas and of Bacon and Hamor on petroleum technology. The work of Doctor Haworth and associates in volume 9 of the University Geological Survey of Kansas is of greatest importance. To the many citizens who have assisted in various ways the collection of data for use in the bulletin the writers hereby express their acknowledgments. The geologic map of Kansas is that prepared under the direction of Doctor Haworth. The geologic maps of the various counties have been prepared from data gathered chiefly by Doctor Haworth and Mr. Bennett. The Division of State Chemical Research, W. A. Whitaker, director, has cooperated heartily in the preparation of this bulletin both by aid in field work and in the chemical study of Kansas petroleums. Placed on web Aug. 10, 2018; originally published 1917.